“I am the light of the world,” said Jesus. “I have come into this world so that the blind will see” (John 9:5, 39). And to demonstrate it, he healed a man who had been born blind. He came to help people see, to help them understand something about God’s love for them. But Jesus also said that he came to bring blindness: “I have come into this world so that…those who see will become blind” (John 9:39). This is a hard saying — it is easy to understand a physician who came to heal the sick, but it is hard to understand a physician who came to make healthy people sick. Let’s review the story in John 9. 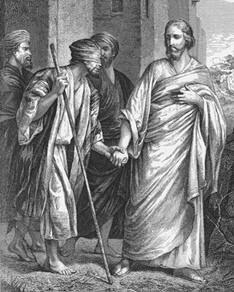 As Jesus and the disciples walked through Jerusalem, they saw a blind man. Somehow they knew that the man had been blind from birth, and the disciples used the opportunity to ask Jesus a theological question that had puzzled them: Whose fault is this, they asked, did the man sin before he was born, or is he being punished because his parents sinned? Problems like this, they assumed, are the result of sin, but who sinned? Neither answer seemed right, and Jesus agreed. “Neither this man nor his parents sinned,” Jesus said, “but this happened so that the work of God might be displayed in his life” (v. 3). Did God cause the man to be blind just so that Jesus could do a miracle? I don’t think that is what Jesus is driving at. Jesus seems to be talking about the result rather than the purpose or cause. The man was born blind, and it doesn’t do him or anyone else any good for us to speculate about whose sin caused it. The man does not need a discussion about the causes of evil — he needs his sight, and Jesus said that the result of his condition is that “the work of God” would be seen in him. And by that, I think that Jesus was talking about more than a miracle. “As long as it is day,” Jesus said, “we must do the work of him who sent me.” A modern proverb that is roughly equivalent is, “Make hay while the sun shines” — or work while you can, because, as Jesus warns, a time will come when you can’t: “Night is coming, when no one can work.” When will that be, we might wonder. When will it not be possible to do the work of God? To illustrate what he meant by being a light to the world, Jesus spit on the ground, made a little mud, put it on the eyes of the blind man and told him to go wash in the Pool of Siloam. It’s hard to know from this account how much the man knew about Jesus. He knew his name, but may not have known much more than that. But he went to the Pool of Siloam anyway, and he was healed. It would have been interesting to see his reaction, but all we are told is that he went home (v. 7). Now, why did Jesus heal the man in such an unusual way? If he just wanted to display a miracle, he would have healed him instantly. He could have said to his disciples, I can give spiritual sight just like this: snap! But the disciples did not see a miracle — all they saw was that Jesus put mud on somebody’s face and then told him to go wash it off. John never does tell us how they reacted when they eventually found out. So the story that John is telling here is not so much about the miracle — it is about how the man learns who Jesus is, and how he reacts when he does. This is the far more important work of God that is being demonstrated in this man’s life. Others were more open-minded, saying that sinners (at least the sinners they knew) couldn’t do miracles like that (v. 16). So they asked the formerly blind man what he thought. “He is a prophet,” the man replied. He is like Elijah, sent by God with a message. The Jews, or at least some of them, didn’t seem to like that answer, so they searched for a way to discredit the miracle. They asked his parents about it, and the parents verified the facts: He was born blind, but now he can see, but we don’t know who did it. They didn’t offer an opinion on whether Jesus was from God, because they were afraid of being expelled from the synagogue (v. 22). I feel sorry for the parents. They had probably lived for years with the accusation that their son was blind because they had sinned. They needed the synagogue because faithful attendance was the only way they could show they were good people after all. Even though their son could now see, they were not willing to risk expulsion — and John probably includes this because it was precisely the situation that some of his readers faced. After Jerusalem was destroyed in A.D. 70, the Jewish leaders regrouped and began demanding more conformity; they did not allow people to attend synagogue if they had any forbidden beliefs about a messiah. John has set before us several types of people: 1) Some who have already made up their minds that Jesus is ungodly. 2) Some who are puzzled by Jesus but still try to discredit him. 3) Some who refuse to say, and probably don’t even want to find out because they are afraid of the consequences. 4) The man who viewed Jesus as good, and was willing to learn more. The Jewish leaders went back to the healed man and asked him again, and he told them again. “We know this man is a sinner,” they said (v. 24). I’m not sure about that, the man replied, but I know for sure that I’ve been healed. He must have been a little exasperated with their attitude, for he asked, “I have told you already and you did not listen. Why do you want to hear it again? Do you want to become his disciples, too?” (v. 27). The leaders were offended by this idea, so they responded with insults, drawing a line in the sand: “You are this fellow’s disciple! We are disciples of Moses!” — and you can’t be a disciple of both. John knew his readers needed to hear that, too. Don’t worry about getting kicked out of the synagogue, he seems to say. You should have left it long ago, anyway. The man became bolder, saying, You don’t even know whether this man is from God, but he opened my eyes, and God doesn’t listen to sinners! “He listens to the godly man who does his will” (v. 31). In other words, Jesus is a godly man who is doing the will of God. “If this man were not from God, he could do nothing.” That’s the central question that runs throughout the Gospel of John: Is Jesus from God? The man declared that Jesus is from God. The Jewish leaders became angry at this layman who tried to teach them theology, and they expelled him from the synagogue. They didn’t want him telling his story to more people. Jesus heard about it and went looking for the man. “When he found him, he said, ‘Do you believe in the Son of Man?’ ” (v. 35). Here Jesus seems to be using the “Son of Man” as a messianic title, perhaps derived from Daniel’s vision of “one like a son of man” who was given supreme authority (Dan. 7:13-14). “Who is he, sir?” the man asked. “Tell me so that I may believe in him.” If you say I am supposed to believe in somebody, then I will. Jesus revealed himself to be the Son of Man, and the man worshipped him (v. 38). Just as he could see physically, he could also see spiritually, and in this way he displayed the work of God in his life. Jesus now gives another theological lesson: “For judgment I have come into this world, so that the blind will see and those who see will become blind.” Jesus is the category by which all humanity will be judged. If people accept him, then God accepts them. But if they reject him, they are rejected. In other words, when a person refuses light, they have only darkness. Jesus is claiming to be the way, the truth and the life. Here he says he is the light, the one who enables people to see. Some people refuse to see. Some are afraid, because Jesus nullifies their badges of righteousness. And when they turn away from Jesus, from the only true Light, they go further into darkness. In this story, the leaders of the synagogue would rather be blind than to admit that they had been wrong. Some Pharisees asked, “Are we blind too?” And Jesus explained his parable: “If you were blind, you would not be guilty of sin; but now that you claim you can see, your guilt remains” (v. 41). When he said, “Those who see will become blind,” he was not talking about people who really had spiritual insight. Rather, he was talking about people who only thought their insight was spiritual light, when it really was only darkness. They claimed to know spiritual truth, but when the Truth was right in front of them, they would not see it. Jesus did not make them blind, but he showed that they were blind. People are judged by the way they respond to Jesus. If they admit their ignorance and are willing to be taught, they are not counted guilty. But if they claim to see, yet reject the only true Light, then they are guilty. When you look at Jesus, what do you see?